Figure 1: USS Minnesota (BB-22) photographed circa 1907-1908. US Naval Historical Center Photograph. Click on photograph for larger image. 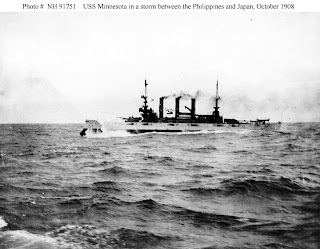 Figure 2: USS Minnesota (BB-22) pitches her forefoot out of the water during a storm while steaming from the Philippines to Yokohama, Japan, in October 1908, during the "Great White Fleet" world cruise. Courtesy of Rear Admiral Fred W. Connor. US Naval Historical Center Photograph. Click on photograph for larger image. Figure 3: USS Minnesota (BB-22) photographed by Brown & Shaffer, 1909. From the collection of Chief Quartermaster John Harold. US Naval Historical Center Photograph. Click on photograph for larger image. 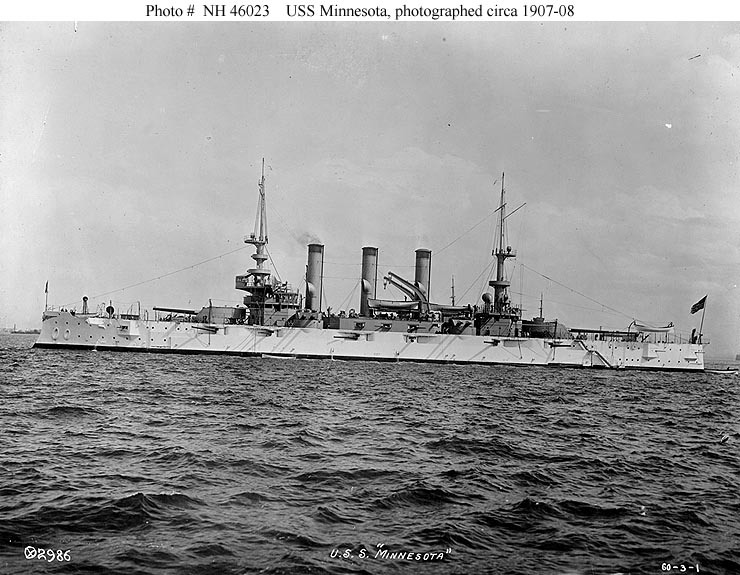 Figure 4: USS Minnesota (BB-22) photographed in 1911 by O.W. Waterman, Hampton, Virginia. She is flying a Rear Admiral's flag from her mainmast and has practice gun sighting equipment installed atop her gun turrets. From the collection of Captain Glenn Howell. US Naval Historical Center Photograph. Click on photograph for larger image. Figure 5: USS Minnesota (BB-22) at the Philadelphia Navy Yard, circa 1919. Note that all of her 7-inch broadside guns have been removed. US Naval Historical Center Photograph. Click on photograph for larger image. Figure 6: USS Minnesota (BB-22) in the Panama Canal, circa 1920. Courtesy of the Naval Historical Foundation, Washington, DC. US Naval Historical Center Photograph. Click on photograph for larger image. Figure 7: “Great White Fleet at Sea, the Second Squadron, December1907.” Painting by Henry Reuterdahl, depicting Rear Admiral Charles M. Thomas on board USS Minnesota (BB-22) during the Atlantic Fleet's cruise around the world. 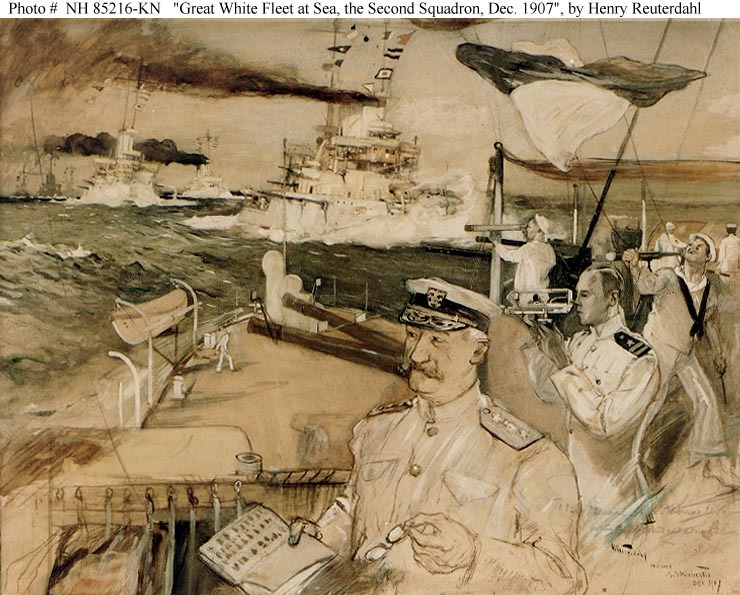 The artist has inscribed the work to Rear Admiral Thomas. Courtesy of the Navy Art Collection, Washington, DC. Donation of Miss Ruth Thomas. US Naval Historical Center Photograph. Click on photograph for larger image. Figure 8: An officer poses in the breech of one of USS Minnesota’s (BB-22) after turret's 12-inch guns, 1908. Courtesy of Chaplain Evans, 1935. US Naval Historical Center Photograph. Click on photograph for larger image. 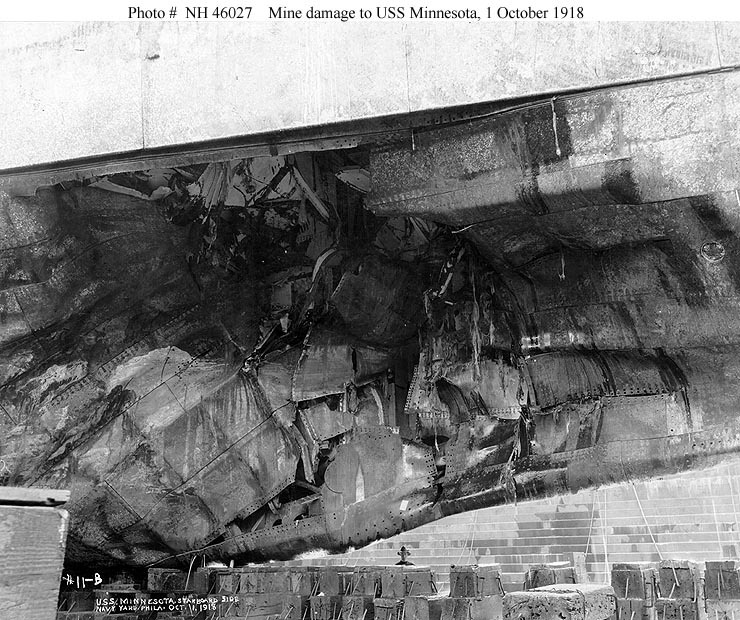 Figure 9: Damage to USS Minnesota’s (BB-22) starboard bow from the 29 September 1918 explosion of a mine laid by the German submarine U-117. Photographed in dry dock at the Philadelphia Navy Yard, Philadelphia, Pennsylvania, 1 October 1918. 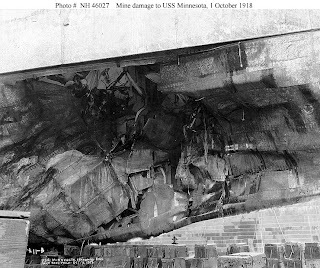 Note hull plating pushed into internal framing and many split seams with open rivet holes. 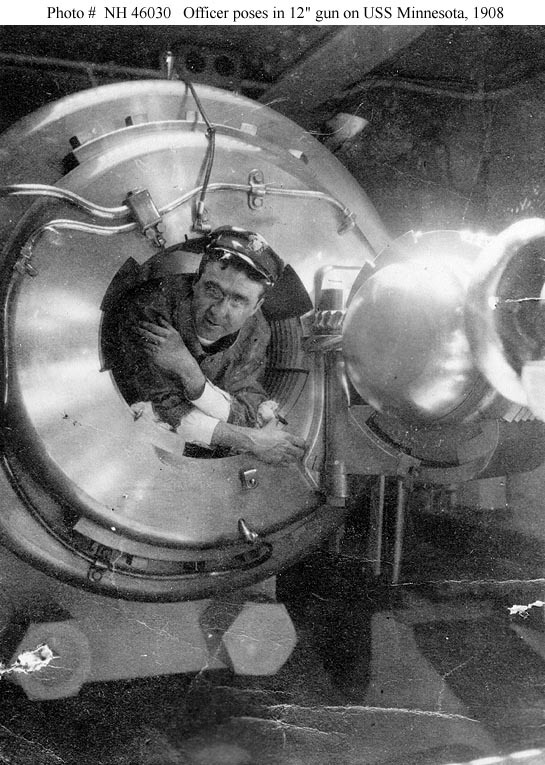 The side armor at the top of the view does not appear to have been much distorted, if at all, by the explosion. US Naval Historical Center Photograph. Click on photograph for larger image. 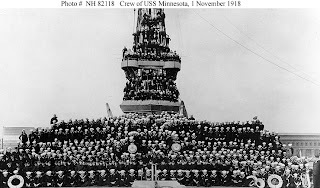 Figure 10: USS Minnesota’s (BB-22) officers and crewmen posed on the forecastle and superstructure, 1 November 1918. 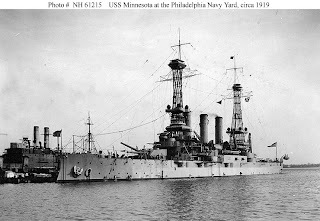 Minnesota was then at the Philadelphia Navy Yard, Philadelphia, Pennsylvania, being repaired for mine damage suffered a month earlier. Collection of LCdr. Abraham DeSomer, donated by Myles DeSomer, 1975. US Naval Historical Center Photograph. Click on photograph for larger image. 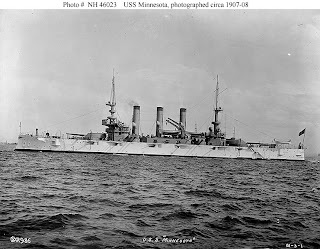 Named after the state of Minnesota, the 16,000-ton USS Minnesota (BB-22) was a Connecticut class battleship that was built by the Newport News Shipbuilding Company at Newport News, Virginia, and was commissioned on 9 March 1907. The ship was approximately 456 feet long and 76 feet wide, had a top speed of 18 knots, and had a crew of 880 officers and men. 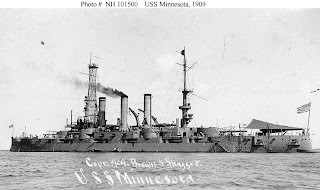 Minnesota was heavily armed with four 12-inch guns, eight 8-inch guns, 12 7-inch guns, 20 3-inch guns, 12 3-pounder guns, and four 21-inch torpedo tubes. After completing her shakedown cruise off the coast of New England, Minnesota was assigned to duty as part of the Jamestown Exposition at Jamestown, Virginia, from 22 April to 3 September 1907. The Jamestown Exposition was one of the world's fairs and expositions that were popular in the United States in the early part of the 20th century. It commemorated the 300th anniversary of the founding of Jamestown in the Virginia Colony. 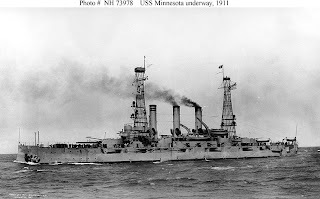 Then on 16 December 1907, Minnesota left Hampton Roads, Virginia, as one of the 16 battleships sent by President Theodore Roosevelt on a voyage around the world. This was the famous cruise of the “Great White Fleet” and lasted until 22 February 1909. The cruise was a huge boost to American prestige and proved to the world that the United States was now a major naval power. It also proved to Congress the need to maintain a strong navy, not only to project power far from American shores, but to protect America’s merchant fleet and business interests overseas as well. 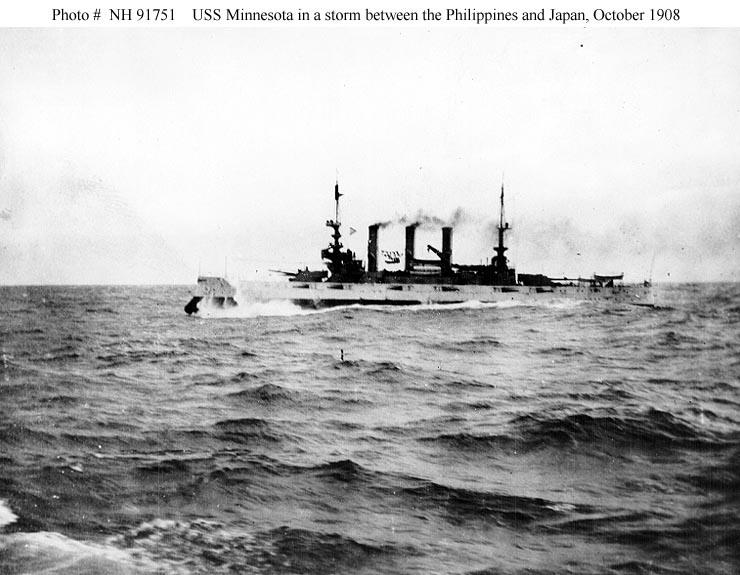 Upon returning to the United States after the successful completion of the world cruise, Minnesota was assigned to the US Navy’s Atlantic Fleet. For the next three years, the ship patrolled along America’s east coast, with one brief deployment to the English Channel. In 1912, the ship began spending more time in the Caribbean. 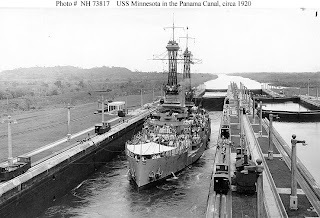 For the first six months of 1912, Minnesota was stationed at Guantanamo Bay, Cuba, and from 7 to 22 June supported military operations that were designed to establish order during a Cuban insurrection. The following spring and summer, the battleship patrolled off the coast of Mexico. In 1914, she twice returned to Mexican waters (26 January to 7 August and 11 October to 19 December) as that country was torn apart by political turmoil. In 1915, Minnesota returned to America’s east coast, but also made occasional trips to the Caribbean. In November of 1916, Minnesota became the flagship of the Atlantic Fleet’s Reserve Force. 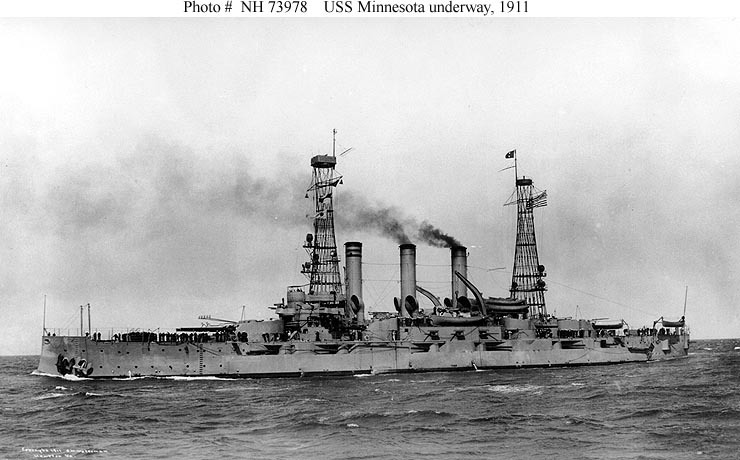 On 6 April 1917, as the United States entered World War I, Minnesota was placed back into the active fleet and was assigned to Division Four of America’s Battleship Force. During World War I, she was used as a gunnery and engineering training ship, cruising off the Atlantic seaboard until 29 September 1918. On that date, 20 miles from Fenwick Island Shoal Lightship off Fenwick Island, Delaware, Minnesota hit a mine, which was apparently laid by the German submarine U-117. The battleship sustained serious damage to her starboard side, but fortunately there was no loss of life. Minnesota managed to reach Philadelphia, Pennsylvania, where she underwent five months of repairs at the Philadelphia Navy Yard. On 11 March 1919, Minnesota left Philadelphia and was assigned to America’s Cruiser and Transport Force. As part of that force, Minnesota completed three round trips to Brest, France, and brought back to the United States roughly 3,000 American troops. She remained with the Cruiser and Transport Force until 23 July. After that, Minnesota was used as a training ship. She conducted two midshipmen summer cruises (in 1920 and 1921) before being decommissioned on 1 December 1921. 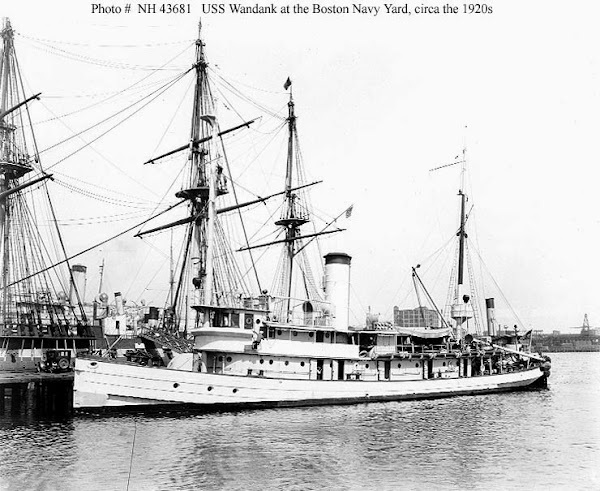 USS Minnesota was struck from the Naval Register that same day and was sent to the Philadelphia Navy Yard to be dismantled. On 23 January 1924, what was left of the ship was sold for scrap.